The Consorzio Sale Natura rises in the very characteristic and interesting place of Nubia, in the territory of the municipality of Paceco, along the north-western coast of Sicily. The place is an ideal one for the salt production since by two thousands years, thanks to the unique marine and atmosferique characteristics allowing to obtain up to three prodactive cicles yearly of an outstanding sea salt that distinguishes for its organoleptic and healthy characteristics. The salt pans are embedded in the homonymous Natural Reservoir. This allows to ensure the quality, the genuinity and the healthy of the final product. The salt pans can be visisted at any time as well as the Museum of Salt rising in the same salt pans. The best time to visit the salt pans goes from May to September. The salt is collected in the months of July, August and September. 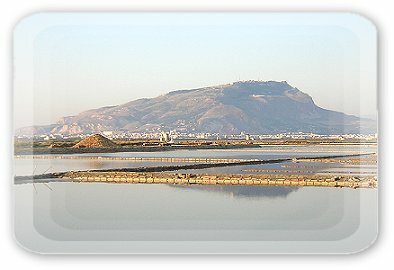 The salt pans can be easily reached by car starting from the town of Trapani or the town of Marsala. A visit to the salt pans also allows to see several birds like the pink floyds that stay for a while in the salt pans during its travel from France to Africa. 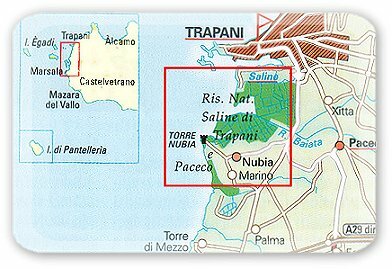 Trapani can be easily reached by plane with one of the several flights that daily collegate the local airport "Senatore Vincenzo Florio" with the most important Italian towns. There are also several maritime routes joining Trapani with the other Italian ports.